I know that not all of the coven, nor the readers do. Personally, I do NOT love them as much as urban fantasy books, but I do find the stories interesting. At the library the other day, I picked up two books that I had seen many times at the bookstore that I just didn't want to invest money in (you know how it is... worries about wasting money on a weird or crappy book...) Anyway, I picked up The Chronicles of Faerie: The Hunters Moon, and The Chronicles of Faerie: The Summer King by OR Melling. Idealistic Findabhair and her cautious cousin Gwen have always shared a love of fantasy and hunted for a door into other worlds. 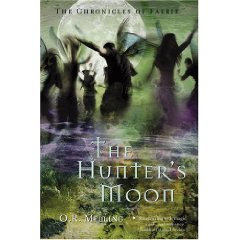 The teens plan to spend their summer hitchhiking through Ireland, but when Findabhair is abducted from a barrow by the King of the Faeries himself, Gwen has to become self-reliant and overcome her fears in order to rescue her cousin. When she finds a gateway into the Faeries' world, she is unprepared for the beauty of their land, and for her cousin's decision to stay. Complicating the matter is Gwen's memory of the words from a dream: "I, too, was the Hunted and the Sacrificed." Fearing for her cousin's life, Gwen must take help in whatever form it comes to see Findabhair safely delivered from the Faerie lands. Originally published in Ireland (1992) and Canada (1993) to much acclaim, this novel is a compelling blend of Irish mythology and geography. A story that is lyrical and mesmerizing in subject and scope. In the year since her twin sister's death, practical and pragmatic Laurel has had dreams filled with fairies, giant birds, and questions about a king. While back in Ireland at her grandparents' home for Honor's memorial service, Laurel encounters a messenger from the Fairie realm who tells her that to save Honor, she must find the Summer King to light the Midsummer Fire. Hoping to bring her sister back, Laurel forces herself to share Honor's belief in Fairie and enlists the help of Ian, the village bad boy. Their relationship is complicated by the fact that she was on a date with him the day Honor died by falling off a cliff wall into the ocean. While trying to complete their task in the allotted time, they encounter a cluricaun who may or may not be telling them all he knows, ravens trying to stop them from freeing the Summer King, and unexpected things about Ian's true nature. 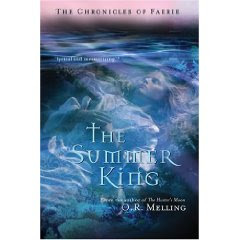 Just by reading the synopsis I was leaning more towards The Summer King too. Thanks for the suggestion Alison! I guess I don't know enough about the whole fairy genre to say whether I like them or not. I would read these for sure! did you guys read the morganville vampires series by rachel caine yet? Just got the 5th one from the library and am super excited to start it!